For a long time now Target have operated their 53 service with a Marshall Dart and step Dart the latter one of the last remaining chances to ride a step Pointer here in Plymouth. Looks like that will be a rarity now as Target have acquired this ex Quantock Pointer 2 Dart which was new to Lothian. It looks the part and sounds excellent! 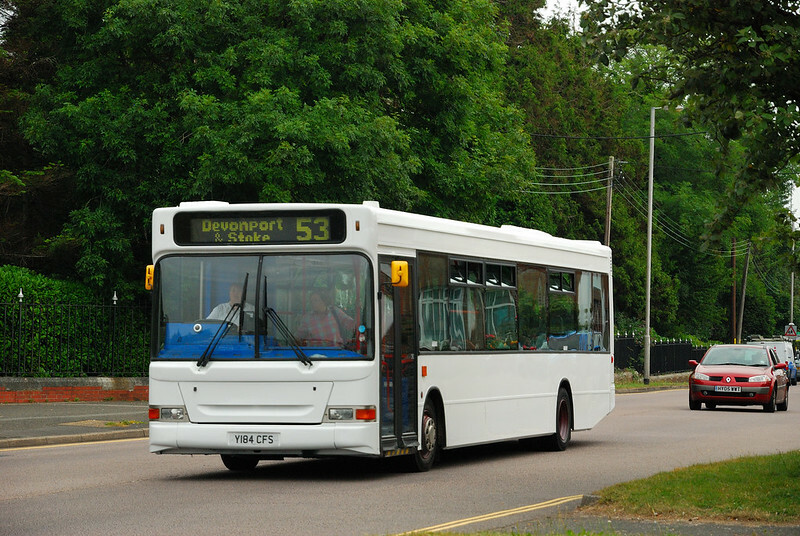 Council check: West Sussex Each Sunday, we take a look at how one of our local authorities is doing in its promotion of bus travel in its area. This week: West Sussex County Council. Final concrete ring cast for Crossrail tunnels Crossrail has cast the last of the 250,000 concrete segments that are being used to line the tunnels under London. The final piece was cast at a dedicated Crossrail factory in Chatham, Kent, where 110,000 tunnel segments to line Crossrail’s 12km long eastern twin tunnels, from east London to Farringdon were produced. ‘ Scene’ in Nottingham, Heanor and Ripley today This week has seen the launch of the new ‘trentbarton’ ‘rainbow1 and ‘rapid 1’ Optare Versa buses to the public (see my yesterday’s blog). Today saw them launched into service. ‘ Scene’ in Derby One day about a year ago, I watched a young woman with a double buggy, two small children and several bags of shopping make three journeys up the steps to put the children and the shopping onto a ‘tb’ coach and then to fold her buggy and put it in the luggage locker. At the next bay stood an almost empty ‘yb’ Citaro onto which she could have just walked without breaking stride. Two Cardiff city bus station sites examined Council leader Phil Bale said the new bus station would allow the council to "redesign our welcome to the world". Local people will be consulted on the location, design and the temporary bus stop arrangements in the autumn. There's a New Kid In Town: Part 2 Epsom Buses also had something else happening in their fleet. Whilst Metrocities are coming in, double decker flagship routes 406 and 418 got a frequency and PVR increase. To cover the PVR increase, new buses were ordered. Read on to find out more. A Cunning Plan : Failure and Success There has to be a big question, however. How can it be that with vastly clever signalling technology, updated at a cost of zillions of pounds, a simple thunderstorm paralyses vast tracts of a busy commuter railway? Surely there should be some surge protection plugs somewhere in the electronic wizardry? Hartlepool & Teeside The second half of tour day one was a little more low-key than the variety of liveries found further north and interest was certainly far less than in previous visits to see REs in Hartlepool and Cleveland Transit and United on Teesside so this report will be on the short side. Hopefully the views will still be interesting. Rumour has it that Target are painting buses for First to speed up a big refresh in a Plymouth? i hear they have a new sprayer joined them. he was the guy who painted pctpg 7552. compare the finish of that to pctpg 53 which was done by his predecessor! It's just a shame they still put the Solo's on the 59 route. Awful buses, one of which broke down near Bickleigh last Tuesday and completely blocked the lane!